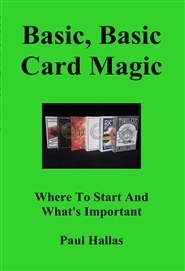 Whether you are a beginner or just a magician wanting to move more towards card magic, this little booklet will get you off on the right foot. It's neither the dry tone of an old classic nor scholarly prose, but written in a direct but conversational style. This is the basic, basic card magic skills you need to know with good examples of how to use what you learn. At this low price, can you afford to miss it? It belongs on your magic library shelf!